This is not an example of bad construction nor poor oversight. One cannot simply jack hammer a sidewalk and put down anything they want. Everything is laid down according to code. 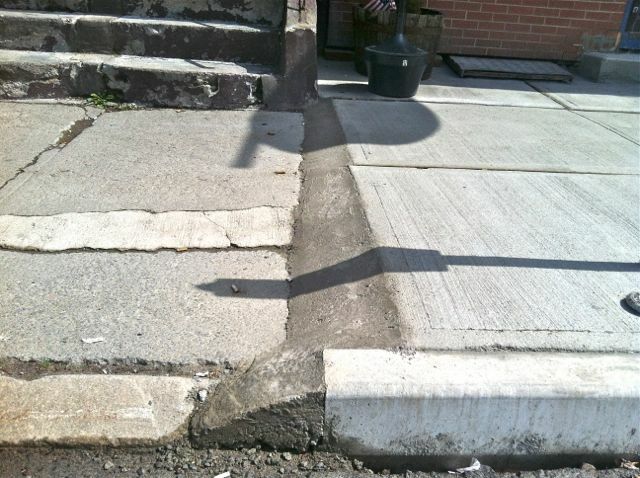 Code states that the curbs must be 6 inches in height. Stay your gavel and break out your ruler. This is an example of good construction. Unfortunately, the neighboring sidewalks are in terrible shape. You ask the wrong questions. What do the sidewalks which are dangerously in disrepair say about those business owners, about the city that ignores them? Criticize those that leave the 700 block to ruin not those that make efforts to improve the city.